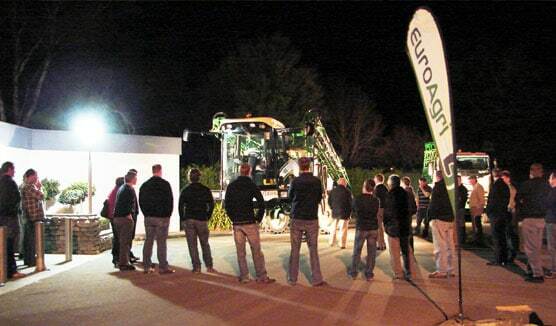 Househam Sprayer launch attracts farmers from throughout Canterbury, Househam UK Manager attends. EuroAgri hosted Canterbury contractors and farmers for the September 9th, New Zealand launch of Househam’s new AR Series Self Propelled Sprayers. Househam UK Director and Sales Manager Jim Dickinson, flew to New Zealand for the launch and spent the previous week visiting clients’ farms. On display at EuroAgri was an AR 3000 Sprayer (24 metre boom, three thousand litre capacity with Househam’s renowned Air Ride suspension, plus a new Isusu truck with a 24 metre boom, 3,000 litre Househam demount sprayer. “It was great to see so many progressively-minded farmers at the launch… they were impressed with the Caterpillar engine, updated electronics and new cab with excellent rear vision,” said James McCloy, EuroAgri General Manager. Overseas the high-spec AR 3000 is Househam’s most popular self-propelled sprayer. EuroAgri is Househam’s exclusive New Zealand importer, sales and service agent. “One of the reasons why we rate Househam Sprayers so highly, is that they’re manufactured to suit specific uses – that’s unusual and a big plus,” said James McCloy. Househam is the UK’s number one manufacturer of Agricultural Sprayers, exported worldwide with a range of options to suit any crop or soil type. The range covers virtually every aspect of agricultural spraying; trailed, mounted, amenity and Fastrac Sprayers.